How Much Does Animated Video Cost in 2019? If you’ve ever considered getting an animated video about your brand, product or service, one of the first things that you’ll have thought about is how much it might cost. We all know the benefits, but…how much should you expect to pay? 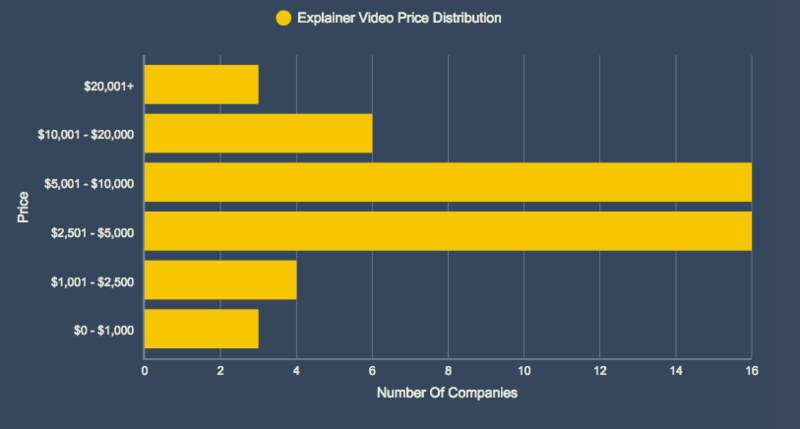 Unfortunately, ‘cost’ is an issue often shrouded in secrecy in explainer video land. You’ll generally need to spend a lot of time reaching out to a variety of different companies to gather benchmark cost data, because most studios want to talk to you to find out more – and get a chance to make their sales pitch directly. That’s perfectly understandable, but, for customers, shopping around the market for pricing data can become confusing and time-consuming, with endless hours spent on phone calls and answering emails. So, we went ahead and did some of the hard work for you! We recently reached out to 70 different explainer video companies and asked them a few simple, uniform questions to establish how much you should expect to pay for a 60 second explainer video. To make it a fair test, we gave them the same 3 examples so that there was a clear direction, and all the studios knew the level of work required. Those examples can be seen here, here and here. You can see our full findings here, but in this article, we’ll cover a few highlights. That’s the average price, but a quick look at the distribution of answers tells a clear story. It demonstrates that nearly half of studios charge between $2,501 and $10,000, with another healthy chunk selling between $10,0001 and $20,000. As you’d expect in any industry, there are a few outliers coming in way above or below these numbers, but you’d have to really scrutinise their work to make sure the price was justified, and/or the end product would be up to scratch. Sounds expensive? The important thing to remember is that video production is a decidedly multidisciplinary task, brought together by a team of creatives with a diverse range of skills. Animation studios excel at bringing these disciplines together under one roof with one consistent project vision throughout. Of course, each of these studios will have their own specialisms, product offerings and packages – so make sure to do your homework. Cost, after all, is only one consideration when it comes to choosing the perfect explainer video partner. You should also ask about any hidden costs that may pop up as your project unfolds. The prices we’ve discovered are ‘starting point’ prices, but we can’t be entirely sure that they represent the full extent of what you’ll pay. For example, if a studio charges for each round of feedback and changes, the cost can quickly rack up. So make sure to ask! What makes up a video? Although your ‘video’ represents a single end product, it’s made up of a number of diverse processes. Each of these stages comes with its own level of expense! You’ll start out with a brief which is an initial statement of how you’d like the video to go – what features to include, how you’d like it to look, and more. Based on this, the next stage will be a script, which sets out the voiceover for your video, and the action that will take place on the screen. Next, you’ll need to get your characters and graphics illustrated. Perhaps you’ll also include some stock images. You’ll obviously need to think about animation, the process that actually makes the graphics move and come to life. You’ll need to add a voiceover, any sound effects and of course your soundtrack, whether you plump for royalty-free music or the latest One Direction hit. The final version of your video will need to be rendered, before finally being uploaded and delivered. Along the way, you’ll need to consider the impact that any meetings, phone calls and e-mails will have on your resources. And, of course, it’s unlikely that you’re going to be happy with the first draft at every stage. You’re probably going to need revisions along the way, and many companies and agencies charge for this too. Of course, this data assumes that you’re enlisting a studio to create your video. As the old saying goes, ‘there’s more than one way to skin a cat…’ and there’s more than one way to make a video, too! While it isn’t the easiest task in the world, you may also consider assembling a team of freelance creatives to put your video together. Letting a video production company manage the whole process for you is often a ‘less stressful’ approach! Video production companies have valuable experience and expertise, leaving you to concentrate on your day-to-day work, and not get tangled up in the finer details and technicalities of your video. So what’s the downside? Well, some companies are very expensive and you could find yourself with a bill more than £20,000 per minute of animation. Pricy! Even more frustratingly, you might not even know how much you’re going to be coughing up until the bill lands on your desk when your video’s complete. With optional extras throughout the process, the price you end up paying can often be a whole lot more than the original quote you were given. Revisions can be a problem, too. Many companies place a cap on the number of changes allowed, and some even charge you each time you tinker. If you’ve got a clear idea for the creative direction for your video, this obviously isn’t ideal! With a number of other projects to occupy their time, you may also find that some companies are less than specific regarding when they’ll be able to work on your project. You need some element of certainty regarding the turnaround on your video. How long will the script take? Will it be done simply when Bob the Copywriter has a free moment? For these reasons, it’s always best to do your research before you choose a video production company; do they offer fixed pricing? Are they reliable? Do they specify their turnarounds? And do they give you the power to make the required revisions without adding to the bottom line? If you’re feeling adventurous and want to co-ordinate your own video production, you could always do it yourself, enlisting the help of freelance creatives. There are a number of immensely talented freelancers who can help you with the various components of a video. The thing is…how many are you going to need? Video production takes a dynamic set of skills, and you’re likely to need several different people to work on your project. You’re going to need a freelance copywriter to create your script. Next up, you’ll be hiring a freelance illustrator to create your characters and graphics. And then you’ll need to bring in a freelance animator to make it all sing and dance. You’re essentially assembling your own video production team. Will they all ‘get it?’ That is, will they all understand exactly what you’re looking to achieve? Will their work compliment each others to create a smooth and attractive end product? Also, don’t forget that you’ll likely be paying freelancers by the hour. Any changes? They’re gonna cost you. Wholesale changes? Get ready for costs to start spiraling quickly away from your original budget. Freelancing is a good way to retain an element of control over your project, but ultimately there’s no certainty over the price you’ll pay, and the whole project could end up turning into a white elephant. That all seems like pretty stark reading, but there is a better way. Here at Wyzowl we’re immensely proud of the service we offer. We know how important it is that you know when your video will be completed, which is why we offer you fixed turnarounds for each process, so you’ll know when your script, storyboard and completed video file will be with you for review. And we’ll make sure we deliver on that, too. We keep pricing simple, too. We charge a simple, per-minute price for our animation, and that’s the price you pay. It’s all included in the package. We’ll also make unlimited changes to your video within the scope of the project, at no extra charge. Our all-inclusive service includes any sound effects, stock imagery, soundtrack, and we communicate via our purpose-built Project Manager so you can review every bit of correspondence we’ve had. ANSWERED! How Much Does Animation Cost For Small Businesses?